Description: First official portrait of President Gerald R. Ford. August 27, 1974. 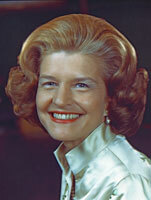 Description: Official portrait of First Lady Betty Ford. October 2, 1974. Description: Portrait of President Gerald R. Ford on a train ride from Vozdvizhenka Airport to Okeansky Sanitarium for bilateral talks with Soviet General Secretary Leonid Brezhnev. November 23, 1974. 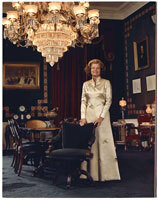 Description: Portrait of First Lady Betty Ford. ca. December 24, 1975. 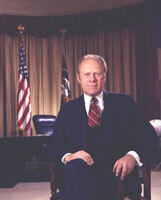 Description: Second official portrait of President Gerald R. Ford. February 25, 1976. 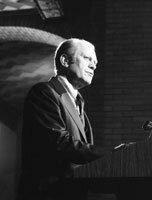 Description: President Ford makes remarks at the dedication of the National Defense University at Fort Lesley J. McNair. January 18, 1977. Description: Lithographic copy of an engraving of U.S. President Gerald R. Ford by the staff of the U.S. Bureau of Engraving and Printing.